Perhaps you imagine that enlightened lawmaking will bring our nation’s rampant inequality problem under control. History tells us the prognosis may be much, much more grim. We spoke to the author of one of the scariest books we have ever read. His exhaustive research did not find any peaceful means of successfully wiping away inequality in the long term. 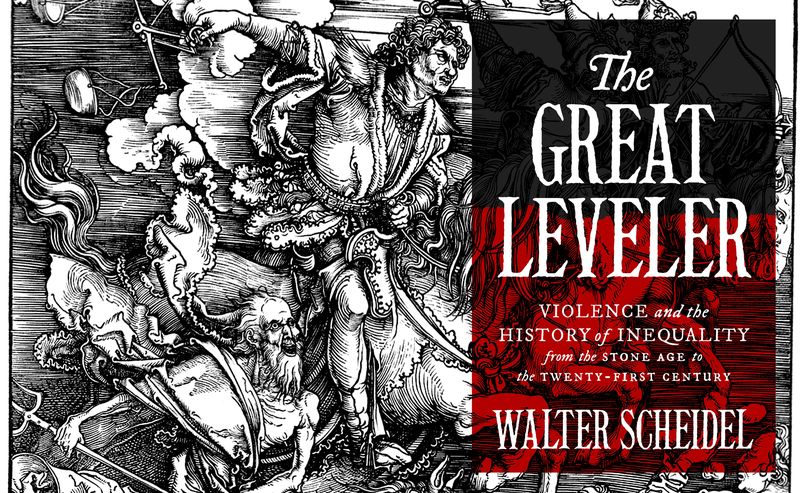 We spoke to Scheidel about the Four Horsemen and the terrifying lessons of history. When you undertook this, did you suspect your findings would be so bleak? Walter Scheidel: I had the intuition, but I expected more conflicting evidence. I expected much more friction or pushback, but it didn’t really come up in the [historical] record. You write about how the inequality-leveling effect of war only arose with modern wars, whereas in the past, wars actually increased inequality. Scheidel: It seems like most wars in history, you had less intense participation of the population. You had people who are specialists in violence—professionals, mercenaries, a warrior class within the population, and they go and do all the fighting. And civilians suffer, but it doesn’t have the same effect on the overall population. It may also have something to do with modern industrialization. Now, if you fight a war in the 20th century, you have to mobilize not just the soldiers, but the entire work force to produce all these resources for war. So I think these two things come together. It’s the mass mobilization that comes out of the nation-state, and it’s industrialization. If you put those two things together, you end up with transformative wars. You conclude in your book that this form of mass warfare is gone, at least for now. Scheidel: At least for now. We can never say for good. But for the foreseeable future it seems to be gone. If there’s another war, it’s going to be a very different war. It’s not going to be a war of tens of millions of people. It’s probably not going to last years either... because of technological change. We’re not going to have mass mobilization. We’ve moved on from the draft. Really, it doesn’t make a whole lot of sense—you don’t need a whole lot of people to operate this very expensive machinery. You spend much more money on the hardware, and less on the people. When it comes to revolutions, it seems like the reduction in inequality is correlated more with the level of violence of the revolution than with any political aspect? Scheidel: That’s the way it turned out. It probably wasn’t necessary for the Russians and the Chinese to kill so many people. You probably have to kill some people, if you want to change things, in this case, because otherwise it’s just not going to happen on that dramatic scale. But it wasn’t necessary to kill millions of people. I think the point could have been made more easily. You can take Cuba as an example. Fidel didn’t kill that many people—some, but nothing compared to what happened earlier [in the 20th century]. So it’s possible, it seems, it’s just not very common. Because once you have a regime in place that wants to change everything, they always tend to be very prone to mass violence. Even the French Revolution didn’t measure up to more modern revolutions? Scheidel: It was really a bourgeois revolution. It wasn’t really to favor the poor, it was the middle class against the aristocracy. And you chop off the heads of a few thousand rich people, that’s about it. You have some redistribution, but not really a massive scale. They really liked private property, too. And there were no less bloody revolutions you found in modern times that appreciably reduced inequality? Scheidel: Well, if you look at the bloodless revolutions of 1989 and 1991 when they broke down Communist regimes, what happens is the exact opposite: you got rid of communism, you put in a market economy, and inequality pretty much doubled overnight. In Russia, it took just a few years for that standard metric to double. It was quite amazing. As for state failures and system collapse, the third leveling factor you name, do those usually come out of wars and revolutions? Scheidel: They can. If you go back in time, you can have environmental causes. People often ask, “What about climate change? Isn’t this the next big source of disaster?” I guess it might be. That could destabilize some states. And it has happened in the past to the Maya and any number of people who were hit by environmental shocks, and that would undermine existing institutions and bring down the states. But the states were much more brittle then than they are now in most of the world. Can you explain why state collapses bring about leveling, rather than just hurting everyone equally? Scheidel: It hurts everyone, but not equally, for the simple reason that some people have much more to lose. It’s really extremely straightforward logic, if you look at it. If you have a lot of stuff, and you have stuff either because the state protects you or you benefit actively by being on top of that state, if the state goes away, you’re really very exposed, and may well lose your title and your rights and claims to various resources. Poor people may lose some, but if they lose too much they’re going to starve to death. But a rich person can lose 90% and still be around. Everyone is worse off, but the rich more so because they have more to lose. That holds true all the way up to Somalia [in the 1990s]. It seems that there’s a lesson there, that the state is the only thing that keeps rich people from the pitchforks, historically speaking. Scheidel: In a way, historically speaking, yes... it’s also a matter of scale. If everything falls apart you may still have warlords or locally powerful people, but they’re not going to be super rich, because they don’t have the catchment area to gather resources and hold onto them. Can you explain how mass epidemics and plagues lead to economic leveling? It’s actually tied to the cost of labor, right? Scheidel: That seems to work mostly in pre-industrial societies, where most people work on the land. If you have a plague, it kills a lot of the work force but it doesn’t destroy stuff like war. So all of a sudden, it’s the same capital stock but there’s fewer workers. That has to drive up the cost of labor and drive down the cost of all these fixed assets, like land. That’s something we see multiple times. It’s not clear that would still work today; luckily, we don’t know. And that is something that you also believe is not likely to happen again in our modern age? Scheidel: A), we don’t know what the effect would be. And B), there are all these books “new super bugs” and whatnot, and it’s all possible, it’s just that we have made so much progress in genetics and will continue to do so, it shouldn’t, unless we’re really unfortunate, blossom into this sort of global disaster. You also looked at peaceful attempts at reducing inequality, like land reform, which is basically redistribution of wealth. Can you explain why that didn’t measure up? Scheidel: Land reform used to be really essential, because most people worked the land, so that was the main determinant of the degree of inequality. So the logical response was to say, “Why do so few people own so much land? If you parcel it out to other people [inequality will decrease] as a result.” There are just so many ways of subverting this and manipulating the process if you’re in power... the most obvious one is, you parcel out land to all these poor farmers, and they may lack the capital to farm properly, or they may run up debt, or any number of things can happen, and when they go into debt they just sell the land which they now own back to rich people, and the rich people will re-accumulate all the land. After 100 years, you’re back to where you came from. It happens quite a lot. You didn’t find any stable societies that had pursued redistribution of wealth that had any meaningful impact, outside of revolutions? Scheidel: If they do, it’s in the wake of wars, and that sort of thing. It does happen, but if you look more closely there’s a connection between some violent shock and an effective program of redistribution. Why aren’t economic crises sufficient to achieve equality? Don’t rich people lose the most in crises? Scheidel: They lose the most, but everything else is still in place. Markets do recover, and as they do, people hold onto their assets or shift them around, and usually after a few years they are back to where they were before the crisis. And there are some exceptions—the Great Depression was an exception, because it was so massive. But even then, you can see inequality creeping up again before WW2, and it’s only really stopped by the war... the general trend is it doesn’t really do much overall. And what about those who say economic growth is enough—if we all get richer, who cares about inequality? Scheidel: There’s nothing wrong with “a rising tide lifts all boats” and such. Economic growth certainly alleviates poverty. Unless you have a really dysfunctional system in place, it has to. So the poor are less poor, and the middle ones are less middling. It’s just that the rich benefit disproportionately. And you could say that’s not a problem, but if you just look at inequality, economic growth doesn’t do much. Strong unions are one of the only things you talk about being definitively correlated with lower inequality. Why hasn’t organized labor been able to keep inequality in check in America? Scheidel: Because it seems to fade over time. There were very few people in unions before WWI... and because, it seems, of mass mobilization, people said “we’re already organized in some sense, and we’re going to organize in our occupations as well.” That was also supported by government at the time, saying “We have to give the people something, they have the right to do so.” And you can see [union membership] spikes during the wars, and worldwide peaks around the 1940s, and sliding down ever since, gradually. So it seems that even unionization needs a really big push to go back up, in most countries. If you were president and you could recommend policies to address inequality, what would they be? Scheidel: It has to be multi-pronged. It has to be reform of the tax system—there’s a strong case to be made for more aggressive estate taxes, because you just siphon off some of the wealth that is passed on from generation to generation, which makes a difference. Progressivity of income taxes is an issue. Support for unions is an issue. A better targeted education, which does not necessarily mean spending more money, but doing it more wisely, including retraining. Because people always complain about how globalization destroys good jobs, and the response is, “Work for Walmart.” That’s not the right response. Has your research taught you something about human nature? Wealth inequality, in particular, is very difficult to get rid of. You can start taxing incomes higher, or the wages may have become less unequal. But if some people still have enormous inherited wealth and others don’t, this is not going to disappear. You need some shock that actively attacks that accumulated wealth and resets everything. And in peaceful conditions, it’s very difficult to see how this could just happen on its own. It seems that the choice is between inequality and violence. Scheidel: It’s not even a choice, because people didn’t choose—it sort of happened, and one of the side effects was that inequality happened to go down... I don’t think people have a choice, in that sense, today. What are people going to say, “Let’s destroy the state?” So there’s never a choice as such, but there’s a correlation. And I think it would be beneficial if policy advocates who talk about “We should do X, Y, and Z” were more aware of the context in which certain things worked and became feasible politically. Is there anything hopeful or constructive that people concerned about inequality can take from these findings? Scheidel: That’s what the history is, whether we like it or not. It doesn’t mean that it always has to be this way. It doesn’t mean that there’s no alternative way of improving things, it’s just we haven’t found it yet... History doesn’t determine the future. It just gives a sense of what’s easy and what’s hard.